Battle of Saguntum (219 B.C.) - The battle which officially kicked of the Second Punic War. Hannibal wanted to instigate a conflict with Rome so he attacked the city of Saguntum, a Roman ally, in 219 B.C.. 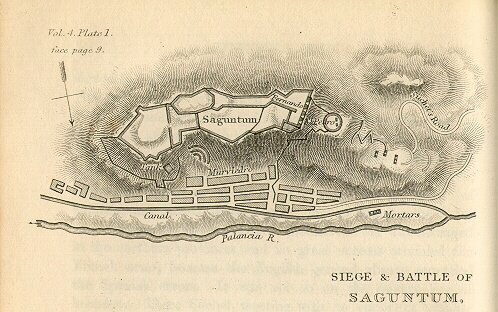 The city fell after an eight-month siege. When Rome finally sent an army in 218 B.C. it was too late. Hannibal had already moved on to Transalpine Gaul with the intention of crossing the Alps. The Romans had expected to halt Hannibal in Gaul and were in for quite a surprise when they arrived and discovered he was no longer there.